Do only step 4 in the instructions. Just put the "www" folder from the mod in your game folder. Someone with good heart can do seila a small video of how to put this mod whenever I do the White screen. When I unpack the exe it says loading large file it might take some time is this normal? Awesome mod. Can you please make a similar mod for my new life? Hi, everytime I try to use the mod, I get a "This door is locked" appear. I have unpacked it successfully and I am not sure what is going on. I copy and pasted the www file from the original folder to the modded folder and it still doesn't work. I just want to make sure of something. For step 4 you want me to copy the www folder that came with the modded version and put it in the main game folder or what?? Please explain. 4. 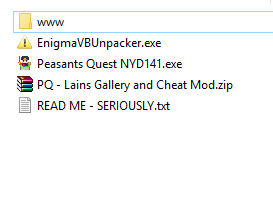 Put the folder named "www" from the mod inside your "PQ - Modded Version" folder. 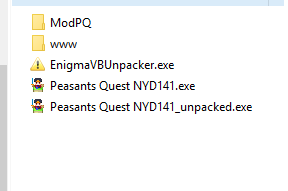 In the mod's zip file there is a folder named www, you put that inside of the folder that you named PQ - Modded Version. so having the compressed version is a lot more simpler? i'll have two of that please! Having a weird issue, when I used the unpacker on the .exe launcher, nothing happens after It finishes packing. However, when I attempt to unpack again I can see the mod folder and exe when searching to unpack. Has anyone had this issue? This is what I can see from the unpack option. This is what I see in the folder regularly. Have you tried refreshing the windows explorer window of the folder? That's my only guess, sorry. I have tried that, maybe ill restart my pc, might help, thanks anyways. Yep no luck, I even tried to copy it from that unpack view, also tried to compress it with winrar it doesn't show it anywhere, like the file doesn't exist but it keeps saying it does.